Biker Dress Dog Harness by Doggles - Red Plaid Customer Photos - Send us your photo! Roxy is ready to roll..... Maybe she is going to BaxterBoo ? Bought this darling little biker dress for Ava and she liked it so much she wanted her best friend Sophie to have one too. They were too adorable in their matching outfits. Love Baxter Boo!! Sasha " Boogie " as I call her is a pudgy Jack I rescued two months ago .She had gotten very ill due to being feed table scraps. Her owner asked a vet to put her down! The vet refused but agreed to give her the medical care to make her well and find her a forever home if they surrendered her. So they did! I flew across the country to CA to get her. She is the sweetest most loving dog in the world! Her old owners didn't deserve her so in a way this happened for the best! Daisy is a tough, smart and sweet French Bulldog-Boston Terrier girl. She can more than keep up with her 3 big brothers. She looks extra cute in all of her Baxterboo gear! Nikita is dressed today with her bikers harness and cap. The message is simple......."you mess with me.....you'll be sorry" says Niki. Posted On 01/04/19 by Arlyn P from Chicago, IL Yes, Arlyn P recommends this product! Great harness with lots of style. Sweet meets sassy! So dawg gone cute!! Posted On 09/02/17 by Pam L from Show Low, AZ Yes, Pam L recommends this product! We love this biker dress! Such a cute look and most important fits great, especially for the smaller dogs. First purchase from Baxter Boo think I'm hooked. Using for Halloween will send pics. Posted On 07/23/17 by Lynda M from , WA Yes, Lynda M recommends this product! It's just about enough to turn you into a biker, with a dog wearing this! People smile when they see her in it, and the fit and quality is wonderful. Posted On 04/24/17 by Cathy F from Katy, TX Yes, Cathy F recommends this product! Harley loves her biker harness! She will be modeling it at the biker rally in the crater. She is a showgirl! Posted On 04/15/17 by Lauren H from Allentown, PA Yes, Lauren H recommends this product! Roxy is my only dog and i just love her with all my heart. I love buying her new stuff. I have the X-small for my 10.5 lbs dog she looks so cute i just love her. This harness is absolutely the CUTEST EVER!! Fits like a dream and is made very well. Service at Baxter Boo is fast and their live chat feature is great! Posted On 03/14/17 by Carol S from , TN Yes, Carol S recommends this product! I love this harness. It catches both the tough and tender side of my girls. Well made and just plain FUN! my dog is 11 lbs and i have the X-small, cute a must have !! This is the most adorable biker chick outfit ever and it fits perfectly! Perfect for my feisty dog! Posted On 02/17/17 by Carol S from Knoxville, TN Yes, Carol S recommends this product! This is just feminine enough with the lace and plaid ruffles and bow to offset the biker vibe. It fits like a dream and suits my little MaltiPoo with her "bipolar" personality ??. Nicely made and lightweight enough for most seasons. A must have for your dog. So So cute. I loooove this dress on Roxy. its funny this dress makes my sweet little girl look tough. this was on sale for $13 and i used my certificate plus coupon with free shipping. This adorable dress was Free thanks BaxterBoo. I love shopping here for my dog. Posted On 10/27/16 by Lauren H from allentown, PA Yes, Lauren H recommends this product! I love this dress but sadly it doesn't fit my 11 lbs dog. I study the sizing chart and my dog should of fit into an X-small and still had room but that was not true. I will wait again until they get a small in. I was sad because this was going to be my dog's Halloween costume this year. 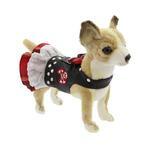 Its so cute i think all girl dogs should have one and maybe in the near future my dog can have one. She is 17'' chest 11'' neck to tail, yes to me it sounds crazy but she will need a small. Love it matches my rock' n roll lifestyle. This is a larger one for my pup she is passing her first one down to her new baby half sister who will be a smaller yorkie. My jumbo yorkie is wearing the larger one now. Posted On 05/31/16 by Dee P from Adrian, MI Yes, Dee P recommends this product! Fits very well, just be sure to use the sizing guide. This particular harness runs big, I ordered a size smaller then she usually wears. And by the way, Baxter boo has the fastest shipping ever! Posted On 05/01/16 by Kelley M from Olympia, WA Yes, Kelley M recommends this product! 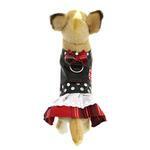 This Doggles biker dress harness is so cute! It is very well made, too. Love this so much! Easy to get in and out of. Daisy looks beyond punky in it. The bow, the little skull, the studs...I love it!!! Posted On 10/03/15 by Emma M from Bessemer City , NC Yes, Emma M recommends this product! Posted On 08/25/15 by KATHRYN R from RIO RANCHO, NM Yes, KATHRYN R recommends this product! Whoo-Hoo. 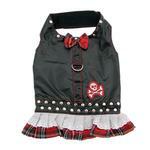 What a hit Zora was in this Biker Dress Dog Harness when I took her to her obedience class. We got a ton of compliments on her in this outfit. I like dog harness dresses. Posted On 08/25/15 by Inga B from Golden, CO Yes, Inga B recommends this product! perfect sassy little dress with just the right feminine touch. Totally adorable on my yorkie! Posted On 07/30/15 by Terry W from muncy, PA Yes, Terry W recommends this product! Pretty cool dress and nicely made. Posted On 07/12/15 by Jannette P from San Juan , PR Yes, Jannette P recommends this product! This item makes everyone laugh as Niki walks by at the park. 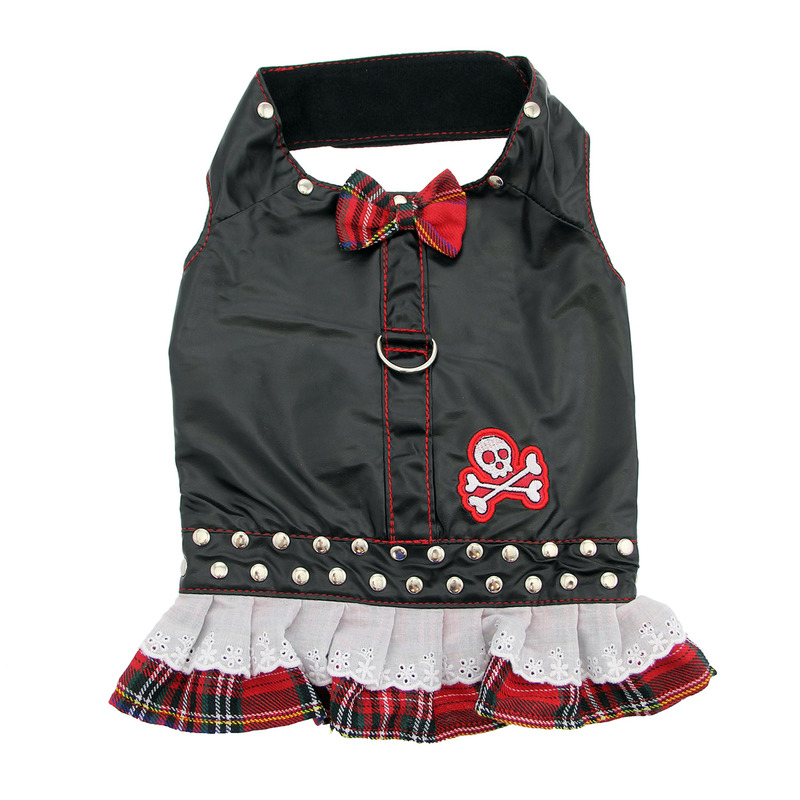 Beside the beautiful details, the leather look is absolutely perfect for every small pooch trying to earn some respect. It's hilarious. I recommend it!!! Posted On 06/03/15 by Jannelle C from , AZ Yes, Jannelle C recommends this product! It was on sale so I definitely hit the jackpot big time with the price. I have a similar one also made by doggles ... now the two little ones can look similar in the winter when they wear these. My 5 pound Yorkie, Harlee, rides with me on my Harley and, of course, she must be properly dressed. The XXS fits like a glove and the quality of the dress is even better than expected! So much fun to build her Motorcycle wardrobe. Also got the Ruff N' Tuff Dog T-Shirt - Black - X-Small for more casual rides. BaxterBoo does a great job with customer service, delivery and order tracking, packaging and product returns. Unfortunately, sizing on dog apparel is very tricky and varies from one manufacturer to the other and from one style to another. I ordered a hoodie and a winter coat in the same size, made by the same company. You would never guess both items were the same size. The hoodie was too small in the legs, chest and too short on the back length - not BaxterBoo's fault, although it would be nice if they noted in product descriptions, when an item is not true to size.